BSNL has announced the re-launch of Promotional Offer for a period of 90 days under GSM mobile services for Tamilandu Telecom Circle customers. State run Telecom Company Bharat Sanchar Nigam Limited (BSNL) re-introduces Combo STVs for voice calling, SMS sending and internet usage for Prepaid plans mobile customers as promotional basis for a period of 90 days. BSNL earlier launched SMS STV 15, Combo STV 82, Combo STV 91 and Combo STV 224 offering free voice seconds, free SMS and free data usage for internet browsing for Prepaid customers from 13th June, 2016 onwards in Tamilnadu Telecom Circle. 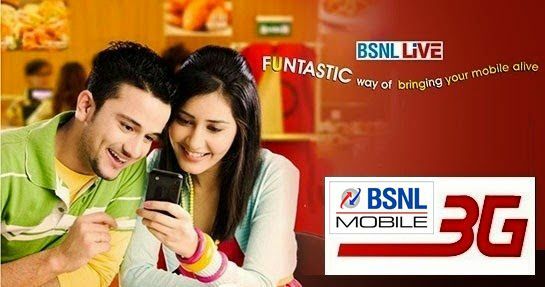 As per latest information, BSNL Tamilnadu Telecom competent authority based on report from various field units and customer has decided to re-launch the promotional STVs used for voice calls, internet usage and SMS sending with bulk freebies under Combo offer for Prepaid plans mobile services. SMS STV 15 offering, Free 2000 SMS for both Local/STD to any network (For the first two SMS charging will be made 50 paisa per SMS on daily basis) comes with 27 days validity. Combo STV 224 offering, Free 19,200 seconds for voice calls (Local/STD) to any network in Home LSA + 500Mb Free data usage in Home LSA and While in National Roaming and 200 Free SMS to any network which comes with 27 days validity. Combo STV 82 offering, Free 400Mb data usage + Free 400 SMS for Local/National to any network comes with 14 days validity. Combo STV 91 offering, Free 600Mb data usage + Free 700 SMS for Local/National to any network comes with 7 days validity. Prepaid customers can activate the above STVs through BSNL Self-Care services by sending SMS from mobile as STV(space)COMBO224 or STV(space)SMS15 to 123. 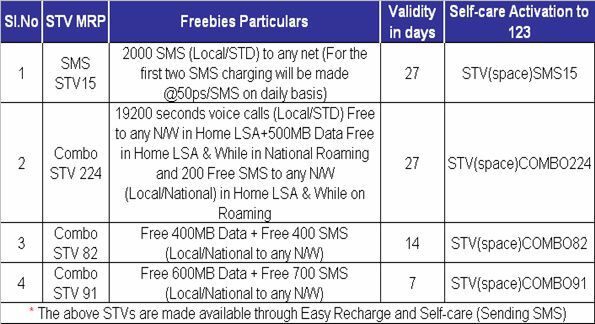 The first two SMS fot he day will be charged 50ps/SMS even in National Roaming. Even if the customer has SMS freebies or any other SMS STV along with any one of the Combo STV, first two SMS will be charged @50ps/SMS, then from freebies / SMS STV. During blackout day also first two SMS will be charged @50ps per SMS and from third SMS onwards charges are as per PLAN (FREEBIES/STV not allowed during Blackout days). No concession/Freebies are allowed after 100 SMS/day as per TRAI norms. Beyond 100 SMS the charges are 50ps/SMS or plan charges whichever is high. The above re-introduced vouchers will be implemented with effect from 13th June, 2016 and available upto 10th September, 2016 for a period of 90 days as promotional basis for Tamilnadu Telecom Prepaid pans mobile customers (Including Chennai Telephone District).